Ever since I was a little kid I have loved changing the rules and game play of my favorite board games. It’s not that I thought the games needed my help (or even needed to be balanced at all). But more that it was a fun way for me to express my creativity. To fight boredom, I would constantly create challenges for myself like the Chess challenge we did not long ago. And today I would like to test you (and myself) to another challenge. Think of one of your favorite board games. 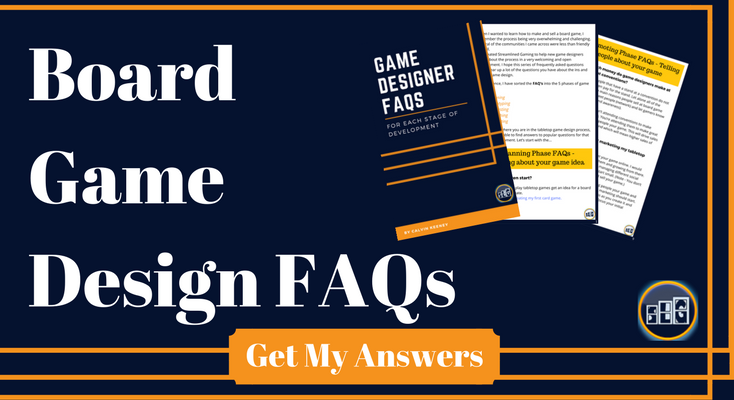 Now pretend that you are the designer of that board game. Let’s also pretend that the game has not been published. But rather it’s current state is what you have just had playtested and you need (want) to make a change based on player feedback. Identify the “Goal” of your changes. Think of several alternative ways to change the game to achieve your “Goal”. It could be a small change (balancing one card) or a large change (like editing a core rule of the game). Theorycraft (guess) at what you think will happen when you add the change(s) to the game. You can also go as far as actually trying out your changes as I plan to do with some of mine. But really this exercise is just to help you think more creatively which will help you make better games. Now let’s see what examples I came up with in today’s challenge. I wrote about Treasure Hunter being one of my favorite card drafting games. And I have also talked about Dominion being one of the best Deck builder games of all time. So I chose to use them for my challenge. And again, I don’t necessarily think that either of these games “needs my help.” Or even if they need changes at all. It’s just something I like to do to be creative and think outside the box. I also just love exploring and testing out new ideas so this is a perfect exercise for me. 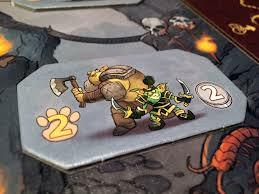 In Treasure Hunter, a big part of the game is to keep goblins away from stealing your treasures. Players must draft “dog cards” to scare goblins out of stealing your hard earned treasures. This is such a fun mechanic of the game that several of the players in my gaming group (family) have started valuing the dogs very highly. However, the people that end up drafting a lot of dogs never seem to win. I’m sure Richard Garfield (the famous designer) has good reason for why he chose the numbers for the dogs and goblins as he did. But I am still curious to see how the game would play out if the dog cards and/or goblin rewards were changed. So that is my goal: To reward players for drafting a lot of dog cards to keep the goblins from stealing their treasures. This will also encourage players to value drafting dog cards higher altogether. The goblins steal 1 more gold than they do already (I would add 1 to the number in the bottom right of the treasure goblin cards.) Currently the goblins steal 1-3 gold when they attack. With my new change they would steal 2-4. This would give the person that picked a lot of dog cards (my grandma) a lot more points. Alternatively, I would instead add 1 to the number in the bottom left of the treasure goblin cards. This would make it harder for players to keep the goblins away from their treasures. It would now cost 2-4 dogs to keep out the goblins (opposed to 1-3 that it does now). I don’t think the 2nd option is very good because it affects the balance of the number of dog cards in the deck too much. The first option I think would be best for completing my goal because it both rewards the player for taking the most dogs while making it more costly to the players that fail to take enough dog cards. To make the victory points cards (VPCs) more fun to have in your deck. Opposed to them just being “dead cards” in your deck and hand as they are now. While some of the VPCs give you positive effects when played, most of them do nothing when played (see above image). As a player, I would like to try the game out with little to no “dead cards”. (Slightly better solution) – Give all of the VPCs a positive effect when played. This outcome would depend a lot on what affects you added to the cards. But I feel like this would be a better change than the first. However, there would still be the other fires start. Such as player turns being even longer than they are now (and we have some really long turns already). A similar problem would occur in that the game would be faster than it is because players decks are better. Though this would be less true than the first solution, it would still occur. You could always raise the number of VPs needed to win. But again, it’s the whole “put out 1 fire while starting 7” in this case. 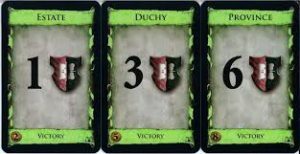 (Best of the 3 options) – Players may discard 2 VPCs to draw 1 card. The wording would have to match the current Dominion wording such as “Action: discard 3 VPCs to draw 1 card. +1 Action” but you get the point. This is very similar to the first solution except that the decks aren’t nearly as good with this solution. I will probably try this solution the next time I play just to see what happens. I’m curious to know how this would affect the Estate cards (1 VP card). The “collect estate” strategy may even be good with this rule change! The 1st and 3rd solution would actually be easy to test as the game is right now. And I will probably try both of these out the next time I play. I want to see just how unbalanced these rules additions make the game. By the way, I am very well known for my experiments breaking my games (in a bad way). So I would not be surprised if my solutions for Dominion made the game much less enjoyable. But that is part of being creative. A lot (most) of times you end up breaking things. Just don’t get too down about it because sometimes something actually works and it feels good. How are you going to balance your favorite board game? As I was writing this post I realized that typing out all of the thoughts going through my head was hard. I kept having to edit for everything to make (a little) sense. So I don’t blame you if you don’t want to type out your thoughts. But I think it would be fun to at least think of which of your favorite games you would try to change and why. You can share your ideas with everyone in the comments below. And if you have a fun gaming group then maybe you can even ask them to test out one of your changes the next time you play. I like a variation in Ticket to Ride where at the beginning of the game: rather than dealing out the normal routes (1 big and 3 small – where you have to keep at least 2) we deal out 5 small routes and no big ones, then keep as many as you like. It makes it more of a challenge to get those bonus points (especially in the 2 player game it pretty unusual to not get your big route for 20/21 points) and often pushes us to pick up more small routes mid-game in an effort to get a small margin. Small margins can win the game and could be equivalent to laying a train of 4 carriages on your go (7 points) instead of 2 (2 points) or 6 (15 points). On top of that – and possibly most fun – it makes it more of a bun fight in the middle of the board (we play Europe version) where players are going for a larger number of short routes that criss-cross more often and lead to fights for key bits of track. oooooooo, I LIKE this! I’m going to have to try this the next time I play. Especially if it’s with 2 players. Thanks for the suggestion, Andrew. I love playing games with 2p and think this would be a fun mod!